Browsing 1 product priced $10 - $15. This stainless steel tumbler is great for beverages hot and cold. 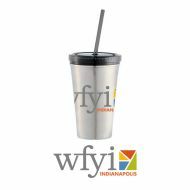 The sleek silver color features WFYI’s logo in white.